For many years, IBM® Cluster Systems Management (CSM) provided a single point of management for IBM Power Systems™ servers running the AIX® operating system. Now you can transform your environment to IBM Systems Director®, which provides CSM clients with the next generation of Cluster Systems Management for their Power Systems servers. 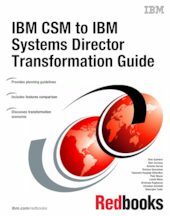 The target audience for this IBM Redbooks® publication includes technical professionals (IT consultants, technical support staff, IT Architects, and IT Specialists) responsible for planning and implementing the Cluster Systems Management software transformation from CSM to IBM Systems Director.